It’s almost Easter, and that means hot cross buns. Although they have been in shops since January (!) I have managed to resist until last week when the display at the front of Waitrose finally persuaded me. I like a traditional bun, spicy and with dried fruit. I’m afraid that modern varieties, flavoured with chocolate etc just don’t cut it at Easter. Although they were very nice – split, toasted and buttered – I couldn’t help looking at the ingredients list and being slightly appalled. I am sure they are all fine, but ‘broad bean flour’? Really? This is not an ingredient that I have ever seen in a regular home baker recipe. Then I was reading the Guardian online and happened across the lovely Kim-Joy in the recipe section. (OK – I know this sounds totally middle class – Waitrose shopping/Guardian reading – I can’t help it, and I’m not making any excuse/apology for it!). Back to Kim-Joy. 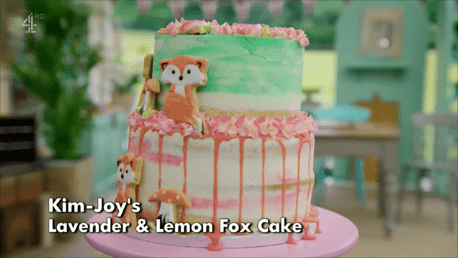 For those of you that are not based in the UK (or didn’t watch GBBO in 2018) Kim-Joy was in the final of Bake Off, and her bakes are distinctive for their total cuteness and attention to detail. In the mood for a spot of Easter baking already I came across Kim-Joy’s hot cross bun recipe. The bun recipe looked just right – spicy and fruity. So I made it. However – I tweaked it a bit. I used 200g spelt and 300g strong white flour (for a bit of wholemeal goodness) and I used whatever dried fruit I had in the cupboard (which didn’t include any peel 😦 ). What I had was some raisins, sultanas, and half a small packet of mixed fruit which included cranberries and pineapple! They all looked a bit dry so I soaked them in orange juice. I started making the dough after work and really didn’t have time to do the whole thing before bedtime. So I mixed the dough until it was really elastic and stretchy and then put it in the fridge. The next day after work I retrieved it from the fridge, brought it to room temperature and carried on. The dough was very wet and sticky to start with but after 20-30 minutes patient pulling and stretching it became lovely and elastic. What is the origin of the hot cross bun? According to some a monk at St. Alban’s Abbey made buns marked with a cross to distribute to poor people on Good Friday in 1361. Although we now make a rich yeasted dough with eggs and butter they would have been quite plain originally as those ingredients were not eaten during Lent. When I was a small child I remember only having hot cross buns on Good Friday (from the local bakery) as a special treat. Back from work I kneaded in the fruit, shaped the buns, then left them to rise while I went for a run. Back home they were ready to go in the oven. Now, I am definitely not in Kim-Joy’s league when it comes to decoration. But I thought I would have a go at the bunnies. Hmmm… please don’t laugh too hard at the results! I don’t think I would get many marks for neatness! Buns ready for the oven. My buns may not win prizes for cuteness or neatness but my goodness the house smells good, and they taste delicious. And the texture is light, even though they are almost half spelt flour. And not too sweet. Still warm from the oven and buttered – yum! I would highly recommend this recipe, but next time I think I won’t bother with the hiding bunnies! It makes 16 good sized buns – even I cannot manage that many buns. I have lovely neighbours and they got to be bun tasters. BUT – I digress. This post is not about pies – it’s about the nation’s favourite cookie – the Chocolate Chip Cookie. And it’s that time of the month again – Staff Meeting Monday. Every little bit of cash helps towards my fundraising, and my very generous and lovely colleagues are quite partial to baked goods to help them through the meeting. The following recipe is from @sourdoughpie’s IG feed from a week ago. (He doesn’t only make pies). Yes – 5 – FIVE bars of chocolate! 500g dark chocolate chips/chunks – it’s easier to buy them already in chunks, but I chopped up 5 bars of chocolate! Cream butter and sugar very well. Beat in the eggs and vanilla. Fold in the dry ingredients carefully. Fold in the chocolate chunks. Rest in the fridge for 24 hours – up to 72 hours. Bring to room temperature when ready to bake. Preheat the oven to Gas Mk 4; 180° C.
Scoop out cookie sized portions with a scooper thing (‘disher’) and bake until bottoms/edges are golden brown and the tops are still soft. This took about 11-12 minutes. The uncooked dough balls can be frozen too. Optional: top with sea salt flakes. There’s plenty of chocolate in these cookies. I used 70% dark chocolate but you could use good quality milk chocolate. These cookies have a good texture and flavour. As always using quality ingredients, especially the chocolate, makes a huge difference. Although you could halve the recipe quite easily if you don’t want to make 72 cookies it’s actually quite nice to have some stashed in the freezer for those cookie emergencies! PS: I’m pleased to say that my left leg seems to have recovered from yesterday’s run. A good sleep and some ibuprofen has done the trick. Have a great week everyone! The morning dawned cold – the car windscreen was icy! And it was an early morning start as the Fullers Thames Towpath Ten mile race kicked off at 8.30 down in Chiswick. After a bowlful of overnight oats with sliced banana and a coffee I was ready to go. I met up with friends from Quit the Gym (fun and friendly outdoor fitness), and shivered as we pinned on race numbers and tried to attach our timing chips to our shoes with numb fingers. Although it was cloudy and cold when we set off the sun did come out and blue skies brightened the morning. Clockwise from me – Kath, Maria, Diethard, David. Ready to go! The route took us over Chiswick Bridge, doubled back to the towpath on the south of the river Thames, and then all along the river to Twickenham Bridge. Then along Kew Road and back to the towpath, over the bridge again and home to the finish line. The tide was high this morning, and the weirs were open at Richmond Lock. Lots of rowers out this morning too. I have run along this path many times, in races and Sunday morning long runs. This week I was seriously thinking Why have I spent £20 to run along a path that I can (and have) run along for nothing?! But actually – it’s totally different. There is a feeling of making an effort because it’s a group event. It pushes you to be the best you can, to catch up with that woman in front. I don’t think I ever did catch up with her, but I did pass a few others! There’s a popular set of pictures that was going around FB recently (although I see by the actual link they are from 2016) that showed the effects of 1, 2 or 3 drinks on people’s facial expressions. Well, I reckon you can get the same effect by running 10 miles – the smiles on runners’ faces when they’ve finished is pretty similar to those after having 2 drinks! The last time I ran a 10 mile race was June 2018 – in 1:34:35. Today – 1:28:10 – woo hoo!! PB! However I really hope I haven’t gone TOO fast – my left knee/leg was somewhat sore afterwards. My nightmare is that I get injured and can’t do all my runs for the next 8 months. Problem is that I am quite competitive with myself, and just cannot help myself from going all out at the end. This run was marked out by great marshalling – lots of support out on the route, and good organisation at the ‘race village’. And I love the pint glass instead of a medal. Plus the obligatory banana of course. Nice memento – and actually useful too. I just have to finish by saying a little about Kew Gardens. We ran along the side of the gardens today. Earlier this week I went there after work and saw some of the incredible work of Chihuly in an exhibition that just officially opened this weekend. It is amazing. If you can possibly get there – go. I can’t wait to go again. FINALLY – I am running a half marathon (or 10 miles in this case – sorrynotsorry) every month this year to raise money for JDRF – researching a cure for Type 1 diabetes. Follow this link to donate if you wish to. Massive Thank You to everyone who has donated already. When I so lightly remarked at the end of the last post that I would write about steps per minute (spm) – aka cadence in the world of runners and gait analysts – and over striding, I little thought how complex and contradictory the topic would turn out to be. I feel like I am now about to embark on an essay from my student pod days (I hope you aren’t reading this Alex Izod! ), and this will definitely count towards my CPD for the year! Let’s look at some real life examples. My average spm on a recent 6 km run was 168, which according to my trusty Garmin is in the ‘green zone’ when I am running at a speed of 5:43/km. A recent interval run had an average spm of 156, and you can see clearly that spm decreases when I’m walking. I had to walk between intervals as I haven’t done any training like that for a while! If we have a look at Tom’s marathon last Sunday his average spm is lower. The Garmin screenshot shows that it is in the ‘amber zone’ for most of the 26.2 miles. The green dots indicate short periods of faster running (and therefore higher spm) possibly to overtake someone or avoid an obstacle. Manchester marathon – Tom’s cadence is steady – but seems quite low? Compare this with Jack’s data – of the same race, which they finished in exactly the same time. Slightly higher spm for Jack, but same speed. Does this matter? What are the implications of a lower stride rate? Well perhaps it doesn’t matter so much. There is a great article by Alex Hutchinson, a man who actually looks at the research, and then applies it to the real world, where he writes that the variability of cadence between runners can only partly be explained by factors such as age, height, experience and speed. In another article Alex writes about leg length – which of course will influence stride length. Shorter runners have a higher cadence than longer runners typically. (Speed = cadence x stride length). That’s one reason why my cadence is higher than Tom’s or Jack’s. If you have time follow the link and scroll down to the link to a YouTube video of the closing moments of the 10,000m race between Gebrselassie and Tergat in the 2000 Olympics. The tall guy and the short guy! Amazing! Sometimes – and I really must stress sometimes – a lower cadence may indicate that the runner is over-striding – their step length is ‘too long’ and that is why they take fewer steps per minute. Over-striding? What is this? In very simple terms it means landing your foot in front of your centre of mass. This is not efficient biomechanics because landing with the knee in extension and the heel striking the ground creates a braking force, and shock through the leg which can lead to injury. It is explained in this article by Matt Phillips pretty well. What a great weekend we have had! On Friday I went up to Stockport where marathon preparations in my eldest son’s (T) house had been well underway for the last 3 months. The training plan was strictly adhered to. Everything was going as it should be. The plan was a 4 hour marathon, and all was on track for that. Although my second son (J) had entered the marathon ages ago he had decided not to run it after all, as after an epic effort last October doing his first Ironman event he hadn’t actually laced up his running shoes since doing 16 miles in January to keep me company on my first half marathon. However – on Friday afternoon we got a text to say he had changed his mind and was coming up after all as the offer of a hotel room going spare (a mate had dropped out) was the little push/excuse to go for it anyway – lack of training or not! J might not have been running – but he has been cycling, skiing and playing football twice a week. On Saturday we found out that a friend, Emma, also running in the marathon was up in Manchester without her family – so we all went out for dinner in the evening which was great fun. We ate in a lovely pub, The Wharf, in Salford. Highly recommended – good food and lovely atmosphere and location by the canal. Sunday – Race Day – early morning start, and it was definitely on the cool side, although the weather was set to get warmer later. Perfect running weather really – cool, very light wind and dry. The runners got ready – kit and shoes, running number/chip, gels, anti friction lube-y stuff for those tender spots, and running watches charged up. Supporters (me, my husband Simon, T’s girlfriend Jenny and J’s girlfriend Anna) got ready – backpacks loaded with water, snacks, tissues, hats and gloves, phones charged up and signed up for updates on runners, and finally – and most importantly – The Supporters Banner. The Supporters Banner was originally made by me and Jenny for last year’s run. We customised it with a Sharpie for this year – adding Emma’s name, plus Will and Steph (the lovely runners I met at Richmond in February), Stuart and Martyn (J’s friends) and Laura (T and Jenny’s friend running her first marathon. The Banner is held aloft with 2 walking poles. It is very portable – which is a good thing. The run started promptly at 9 am. The runners set off in waves. T & J decided to run together, as J wasn’t sure how his legs would cope with running 26.2 miles on no running for more than 2 months! The Manchester bee was at the start giving a boost to all the runners before they set off, some of them in the first marathon and others seasoned runners. The worker bee was adopted as a symbol of Manchester during the Industrial Revolution, and has become more and more popular since the Manchester Arena bombing in May 2017. It now also symbolises unity in the face of terrorism. Manchester bees – running and supporting! Once we had seen them off at the start our band of supporters set off to the next sighting point. This meant getting the tram. One of the things I love about the Manchester marathon is the numbers of supporters – so many people – of all ages from babies to great grandparents! And all cramming themselves onto the tram to travel around in the hope of glimpsing their loved ones running past for a few seconds and give them a cheer! It’s such a good atmosphere. We also walked a lot between various points to see the boys running, carry the banner and give them a cheer. Altogether on Sunday I walked almost 25,000 steps! There were lots of people out to give support to friends and strangers alike. As a runner myself I know how amazing it is when people are out cheering, clapping and calling your name. It really does give you a boost. Finally we made it to the finish, again by tram, to meet T&J – who crossed the finish line holding hands (gotta love ’em!) in exactly the same time 3:43:36 – which is pretty incredible on many levels. I can’t tell you how proud I am of them! Brilliant work sons. We enjoyed fab post run (or walk for the Supporters) at meal at Trof in the Northern Quarter. And then the journey back home down south for me and J and Anna. Such a great weekend. Well done to everyone who ran – Emma and Stuart managed PB’s and Laura also ran a great time for her first marathon. You might have noticed that J is wearing a JDRF running vest. Last year he had his own fund raising page. This year he would like people to donate via my page. If you have already then many many thanks. If not you can donate here. Today I am off to Stockport ready for the Manchester marathon Sunday. No, I’m not running it! No full length marathons for me this year. My son Tom is doing it for the second time, hoping to beat his time from last year. Flapjack type bars are popular with runners because they are high protein for muscle repair and high carbohydrate for energy. They are also high fibre – oats and nuts, dried fruit and flax seed. If you are going to have a sweet treat then these are at least full of nutrients. But be aware – they are high calorie! I decided to have a go at home made protein flapjacks – the ones you can buy are quite expensive especially if they have proper ingredients in them. I adapted a recipe I found on a vegan recipe site. I did change the ingredients a bit to fit in with allergy requirements, what I had in the cupboard and what I like. This pepper has a very different flavour to regular pepper – and the smell of grapefruit when you open the lid is amazing! Preheat the oven to 180 deg C or Gas mark 4. Melt the almond butter, coconut oil and maple syrup gently over a low heat. Put everything else in a mixing bowl. Add the almond butter melty mixture and mix really well. Spread evenly in a parchment lined 18 cm square tin – this was a problem for me, as my smallest square tin was 20 cm, and the mixture seemed quite thin in this. So I used a foil tin that was 18 cm x 12 cm, and accepted that they would come out quite thick! Cook for 30-40 minutes – depends on how big the tin is. I cooked them for 40 minutes, and could probably given them another 5. But very tasty – at least the crumbly bits I tried this morning were! I like this recipe as you can easily adapt it to what you like, and what you have in the cupboard. And it’s a lot cheaper than fancy commercial flapjack type bars. Hopefully the next post will be reporting the amazing success and speed of Tom, fuelled by these flapjacks, in the Manchester marathon. Good luck to everyone running, including Will and Steph who I met in Richmond in February. This was supposed to be written up yesterday but by the evening I was just too tired! My usual Sunday morning run was postponed until the afternoon due to a) the clocks going forward and b) Mothers Day – I spent the morning at the garden centre with my mum. So I decided that my run (and write up) would take an historical turn, looking at two places with the name Pitshanger (or Pitzhanger) in them. The name Pitshanger was first mentioned in 1493, and possibly means ‘an area of sloped woodland frequented by birds’. I live in Ealing, west London, and recently the historic Pitzhanger Manor House has re-opened after extensive refurbishment. I have not had time to go in yet, but I’m looking forward to going soon. There is an exhibition of work by Anish Kapoor on there until August. There has been a house on the site since at least the late 17th century, but the most famous owner was architect Sir John Soane who bought the house in 1800. He demolished most of the house and rebuilt it to his own plans as a classical Georgian villa. It was his country retreat, used for entertaining and housing his big collection of artefacts. These are now in his London house in Lincoln’s Inn Fields. Soane used to walk regularly to Pitzhanger from Lincoln’s Inn – a distance of about 8 miles. My sister’s wedding day 13 years ago! I have two connections to Pitzhanger – number 1 – my sister was married there in 2006! It is a lovely wedding venue – very classy, just like my sister. And the second connection is that in the 19th century my Crace ancestors were interior designers/decorators who were commissioned by Sir John Soane to decorate some of Pitzhanger Manor (and his house in Lincoln’s Inn). I found a lovely blog that has a potted history of the Crace firm through the 18th and 19th centuries. After running past Pitzhanger Manor, which is now in central Ealing, I ran to Pitshanger Park, which is about a mile away. I have always been quite intrigued about why it’s called Pitshanger Park, because it’s not that near the Manor House. Pitshanger Lane is an old road – originally called Pitshanger Road in fact. It ran near to the Pitshanger Manor Farm. So the lands of the manor were extensive two or three hundred years ago. Now most of it has been built over, but the remains of the farmland can be seen in the Park. There are some old trees in the park, some of which appear to be along old field boundaries. The river Brent runs along the north side of the park. I often run through this park, there is always lots to look at – birds and trees, flowers and people (and dogs)! The whole run was almost 11 km, and although some was along roads it was lovely to run through two very attractive parks. I do feel lucky to live in a part of London that has so many green spaces. Old oak trees in Pitshanger Park – ‘sloped woodland’ – I see lots of different birds here – song thrushes are particularly plentiful. Well, it’s two days since my run in the Chilterns and my legs are still complaining every time I come down the stairs. I honestly don’t think they were this stiff after the London marathon 3 years ago! Walking was more painful than cycling, which is good because I cycled about 10 miles today. I think I might try a very gentle 5 km run tomorrow and see how it goes. I absolutely do not want to end up injured so I won’t be going all out! Rhubarb. It was almost dark when I picked it so not the best photo! Today at work we had a staff meeting, and that calls for cake. One of my fundraising schemes is selling cake at staff meetings – today I raised £15. Thank you to all my colleagues. I made two different cakes today – both from Kellie Anderson’s wonderful blog Food to Glow. I seriously love this blog. So many delicious, intriguing, exciting and easy recipes! I made the carrot/marmalade cake I wrote about in January. And I made these fab blueberry and rhubarb cardamom crunch bars. They’re quite flapjack-y so I’ve taken the liberty of renaming them for here! Although you could easily make them vegan I actually used some butter in them. They were very easy, and I got to use some rhubarb from the garden too. I didn’t have any quinoa puffs or pecans so those got left out. It’s sometimes nice to leave something to try for next time anyway. The marmalade cake is truly yummy, but it does have quite an ‘adult’ flavour I think. It’s certainly not your usual chocolate or vanilla ‘safe’ flavours. But the taste of the rhubarb and blueberry flapjack bars is more subtle, the rhubarb does not dominate at all, and sharpness is softened by the blueberry and the hint of cardamom. Just look at that juicy layer of fruit tucked in the middle of the chewy, crunchy oats! Both bakes went down very well at work. But I was nervous as to how my most important critic would rate them. My colleague’s daughter has a discerning palate when it comes to cake, and although the Spanish lemon almond cakes went down well I wasn’t sure how she would take to rhubarb… I needn’t have worried! My chief taster – I think she likes it! One of the most satisfying things about cooking in general and baking in particular, is sharing the results with friends and family. I’m already thinking about what to bake next! Today I ran the third of my half marathons of 2019. It was very different from the first two, and was in fact the first trail race I have ever done. Wow! It was hard work with all those hills. But a lot of fun and I think I have found a new passion! It was the Maverick inov-8 Original Buckinghamshire – and it was really well organised, with easy parking, ok toilets, a choice of 3 routes (8km, 14km and 22km) – fun for all, great marshalling and on-course signing. A great selection of cakes available! I was running with my friend Steve, who is training for an ultra marathon in the South Downs later in the year. When I say running with him that is not quite right, as he very soon went ahead. The course was amazing – through woods, across fields and definitely up and down hills! There was also quite a lot of mud. Running in this type of terrain is very different from running along a towpath, or in a town. First I had to accept that walking was going to be quite a large part of the experience, but that’s ok because it is for most people. Also I really had to concentrate on the ground because it was so rough. I almost fell twice – tripping on a tree root, and turning my ankle. Luckily both times I saved myself from serious mishap. This bit was very steep – one false step and I would have somersaulted down! One of the best things about running is talking to people. I met a lovely lady called Caroline who asked about my connection with JDRF. It turned out that her daughter has Type 1, and others in her family. We had an interesting chat about Type 1, research, artificial pancreases, postcode lottery for equipment, raising funds etc. It was great to meet you Caroline, and I will look up the Pisa half marathon for December! I also loved the whole scenery thing. Woods, views, brimstone butterflies, red kites hovering over the landscape, violets tucked in the leaf litter, celandine shining brightly…It was great. The local parks might seem quite tame now! The thoughtful organisation was also in evidence along the course at the 2 OutPosts – tables laden with bananas, watermelon, orange sections, drinks, sweeties, energy gels. I don’t usually eat much, if anything, out on runs, but today I was very glad to help myself to something to keep me going. I have done a couple of more traditional half marathons in under 2 hours (yay! ), but I soon realised that today anything close to 2 hours was a total impossibility! In fact I began to think that it might be over 3 hours, as my legs ached, my feet were sore, my core muscles creaked and groaned, and even my arms were hurting! In the end I finished in 2 hours 55 minutes and 41 seconds. All in all – I loved it! I’m hooked on trails, and looking forward to May when I do another in the Peak District with my son Tom. Bring those hills on! Don’t forget – I’m raising funds for JDRF so they can fund research into finding a cure for Type 1 diabetes. If you would like to donate here’s the link!! Thank you for your support. Today we celebrated another family birthday. I decided to make another vegan chocolate cake, and tried a different recipe, by blogger Kate Hackworthy. This one looked more like a normal recipe (albeit no eggs) with a more normal amount of sugar. It said it wouldn’t be dry and crumbly…read on and find out if the claims were justified. The ingredients were straightforward. I had to buy some vegan margarine specially but otherwise everything was in the store cupboard. Even the agave syrup ( I’m on trend like that!). I even still had some oat milk from another recipe – a vegan lasagne. Can’t write about that here because it’s not cake though. It all mixed up easily and looked like ordinary cake. So far so good. I followed the recipe closely – weighed and measured everything. I baked it for precisely 30 minutes. I rested it in the tin for the exact time stated. And then I turned the cakes out of the tins – and near disaster. One cake cracked in 3 pieces. One cake split in 2. See that top crack? It went all the way through! That was yesterday. I let them cool overnight and today I sandwiched them together and iced them. When I say sandwiched them together – I glued them together. I didn’t use the ‘butter’cream as suggested in the recipe. I made a ganache as for the first vegan chocolate cake I did (see previous post a while back) by melting 250g of dark vegan chocolate (from Lidl – the best ever chocolate) and mixing some oat milk in. Just before serving I decorated the cake with totally out of season strawberries and raspberries, and a sprinkle of edible gold glitter. Then we had 2 photo opportunities – one with a candle and one with little star sparklers. Couldn’t light them all together though so it wasn’t the effect I was looking for really! Out of focus – I was trying to get a picture before the silly sparklers went out! Verdict? Lovely flavour. Fairly moist. Crumbly. Definitely crumbly. Not sure I would do this one again. But – fear not – I have another recipe sent to me by my sister to try. There will be a vegan chocolate cake version 3 at some point. I am now determined to crack this before the end of the year.